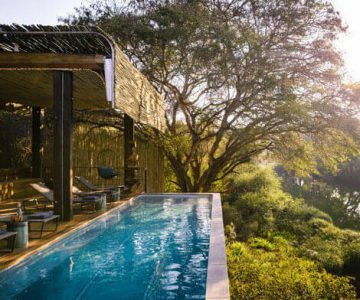 In the secluded eastern reaches of Kruger National Park, Singita Sweni takes up residence atop the lackadaisical Sweni River in a patch of wilderness known for its lion prides. In this elevated sanctuary—and acclaimed Relais & Chateaux—the contemporary design emphasizes the harmony between nature and structure (entire walls of glass make it hard to discern outside from inside), while soft earthy tones are parroted in the fabrics. Boarding aside, there’s a reason Singita Sweni has been dubbed the quintessential African Safari. Here, tracking is an art and seeing the Big Five is on the top of everyone’s mind. Luckily, even from the prow of your elevated deck, all variety of wildlife come to faff about in the waters, heedless to onlookers. It’s hard to know who Singita Sweni is not for…In this lush riverine setting luxury meets the quintessential African Safari meets a sustainable ethos. Oh, and the staff at Singita provide service at an impeachable level. A single supplement will apply if three or more single rooms are booked in a reservation. A supplement of 25% of the adult rate will be added from the 3rd single room onwards. Most Memorable Moment? Watching the animals walk up and drink from the stream from such a close distance was such a unique experience. It truly never gets old. The Sweni Lodge exceeds all expectations—it's beautiful, the facilities are excellent, the staff is incredible and (most importantly) the wild animals that call this place home are VERY special. Singita Sweni Lodge is accessible by both land and air. All flights land at the Satara airstrip located 45 minutes from the lodge. Please contact us to arrange scheduled flights or private charters for your trip. If you’re flying from Johannesburg you can expect a flight of about 1 hour and 30 minutes; from Nelspruit your flying time is closer to 45 minutes. By road you are looking at an 8 hours’ drive from Johannesburg or a 4 hours’ drive from Nelspruit. While big game may be the big draw, there’s still much more to fill your days with: archery, community visits, a tour of the surprisingly large (and impressive) wine cellar. You might even choose to set your sight to the night when the absence of light pollution lets the orchestra of the cosmos truly radiate. A comfortable day bed on your personal deck offers the perfect excuse to finally sleep out under the stars. 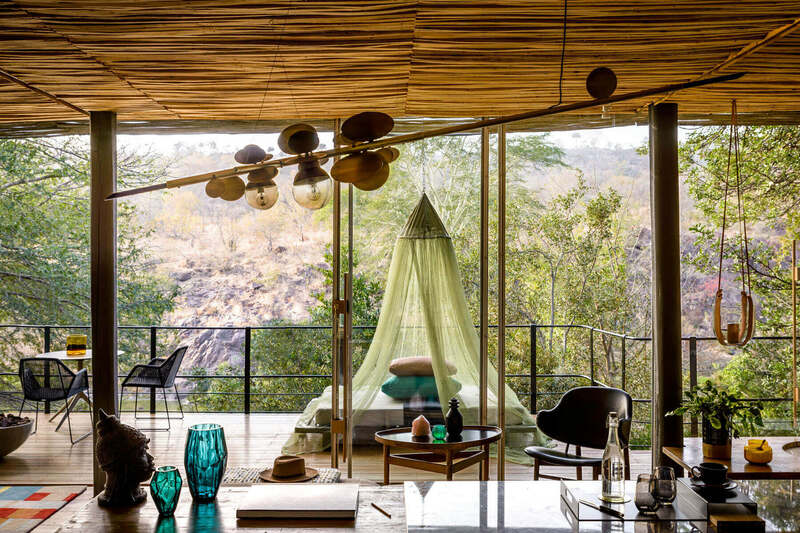 In the Singita style, all seven suites take their cues from nature: look no further than the hues of fabrics adorning the room, full-length glass walls that allow for a constant infusion of light, timber decks that reach out from the trees and offer panoramic game-viewing. Meanwhile, the adoring staff make every effort to anticipate and fulfill your needs. All suites are guided by open-plan living and stretch the concept out to the private timber deck (where a day bed sits primped for cloudless, star-frenzied evenings). An outdoor shower dials up the luxe-outdoorsy vibe with views that constantly remind you of your proximity to water and trees. As the name suggests, a pool is an additional perk included in this private riverfront suite. If more space is required, the shaded deck can be united with the adjacent suite, ideal for families and honeymoon couples. Sossusvlei Lodge provides a perfect gateway to Namib Naukluft Park, offering direct access to the towering red sand dunes and famous pan of Sossusvlei. Looking to extend your adventure? 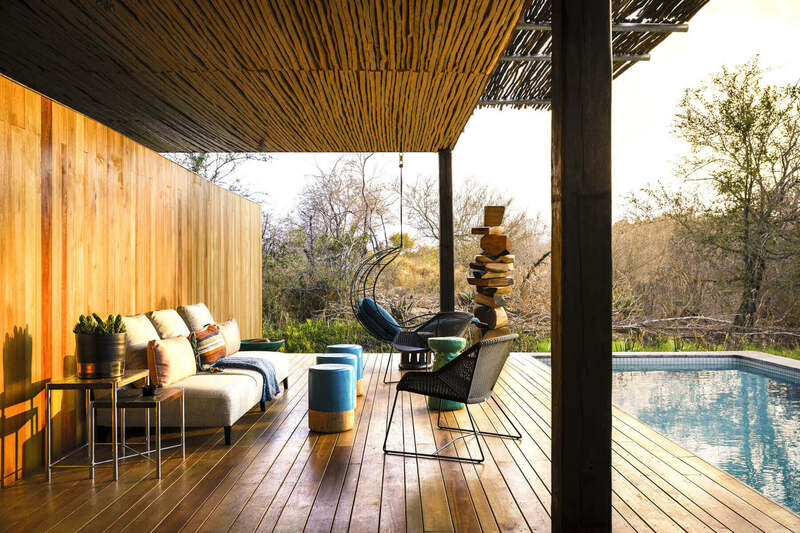 Discover a few ways to weave Singita Sweni Lodge into an even grander journey.